BJP leader Subramanian Swamy has opened a Pandora's box with his allegations that Congress vice-president Rahul Gandhi declared himself to be a British national while floating a firm in the country. Congress has rejected the claims and said that the confusion was created due to a typographical error. However, fresh documents published by The Indian Express have created further confusion over the issue. According to Swamy, who circulated documents purportedly sourced from the company law authorities of Britain, Gandhi had declared himself as a British citizen in the annual returns of his dissolved company Backops Limited, floated in 2003. Swamy said that Rahul was listed as a British citizen on the documents for four consecutive years. 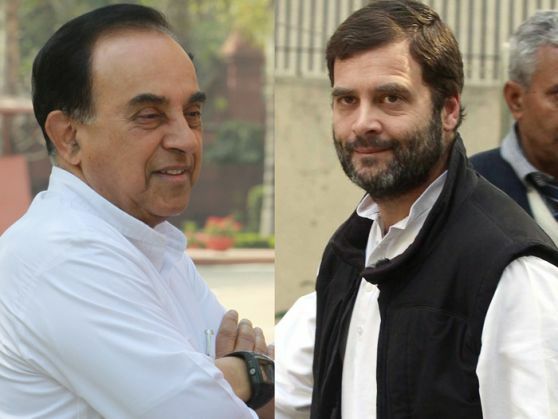 Swamy has written to Prime Minister Narendra Modi and Lok Sabha Speaker Meira Kumar urging them to strip Rahul of his citizenship and Parliament membership. Why? Because India doesn't accept dual citizenship. He has also asked the Enforcement Directorate to register an FIR against the Congress vice- president. Swamy has made public two documents related to the filing of returns of Rahul's company. A return filed on October 10, 2005 and another on October 31, 2006, show him to be a British national. According to an Indian Express report, Rahul Gandhi is the director and secretary of Backops Limited. Ulrik McKnight, a US national, is listed as the second director. Gandhi was the majority stakeholder with 65 per cent shares, while McKnight owned 35 per cent of the shares. However, the problem starts when one looks through UK's Companies House records. The Indian Express reported that when it comes to nationality, the documents reveal three different versions. In one document Rahul is registered as British, in another he's registered as an Indian national. In yet another document, the word British is scratched out, and the word Indian has been handwritten next to it. Congress has denied all the allegations saying that the nationality confusion was due to a typographical error. They claim Gandhi has always held an Indian passport. What does the Indian Citizenship Act say? According to Section 9 of the Citizenship Act, 1955 any citizen of India, who by registration, naturalisation or voluntarily takes up the citizenship of another country, shall upon such acquisition cease to be a citizen of India. How does the controversy help the BJP? With Swamy's refusal to relent, and the contradictory documents making the rounds, the issue of Rahul's nationality could well turn out to be a trump card for the BJP for the upcoming winter session of the Parliament. The Opposition is already planning to use the debate on intolerance to disrupt the Parliament. The nationality confusion, if not countered factually by the Congress immediately, could serve a fatal blow to the party's strategy for the winter session.